Lewis: George Wallace "created the climate ... that encouraged vicious attacks"
McCain: Rep. Lewis' comments are "shocking and beyond the pale"
WASHINGTON (CNN) -- Sen. John McCain called a statement by a Georgia congressman Saturday, which compared the feeling at recent Republican rallies to those of segregationist George Wallace, "a brazen and baseless attack." Rep. John Lewis, D-Georgia, and Sen. John McCain traded tough statements Saturday. Rep. John Lewis, D-Georgia, who has been praised by McCain in the past, issued his statement after several days of headline-grabbing anger aimed at Democratic nominee Barack Obama from some attendees at campaign rallies of McCain and running mate Gov. Sarah Palin. "What I am seeing reminds me too much of another destructive period in American history. Sen. McCain and Gov. Palin are sowing the seeds of hatred and division, and there is no need for this hostility in our political discourse," Lewis said in a statement. McCain has written about Lewis, praising his actions in Selma, Alabama, during the civil rights movement. The Republican nominee even said during a summer faith forum that Lewis was one of three men he would turn to for counsel as president. But the Arizona senator blasted Lewis' remarks, and called on Obama to repudiate them. 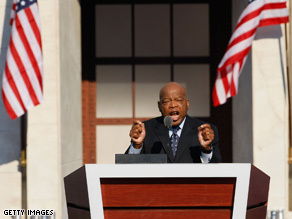 "Congressman John Lewis' comments represent a character attack against Gov. Sarah Palin and me that is shocking and beyond the pale," he said in a Saturday afternoon statement released by his campaign. "I call on Sen. Obama to immediately and personally repudiate these outrageous and divisive comments that are so clearly designed to shut down debate 24 days before the election. Our country must return to the important debate about the path forward for America." Also Saturday, Obama campaign spokesman Bill Burton released a statement on the Lewis comments. "Sen. Obama does not believe that John McCain or his policy criticism is in any way comparable to George Wallace or his segregationist policies," Burton said. "But John Lewis was right to condemn some of the hateful rhetoric that John McCain himself personally rebuked just last night, as well as the baseless and profoundly irresponsible charges from his own running mate that the Democratic nominee for president of the United States 'pals around with terrorists.' "
Later Saturday, Lewis issued a statement saying a careful review of his remarks "would reveal that I did not compare Sen. John McCain or Gov. Sarah Palin to George Wallace." "My statement was a reminder to all Americans that toxic language can lead to destructive behavior," Lewis said. "I am glad that Sen. McCain has taken some steps to correct divisive speech at his rallies. I believe we need to return to civil discourse in this election about the pressing economic issues that are affecting our nation." CNN political producer Ed Hornick contributed to this report.